The difference between the thinking of man and the ways of God is huge. Man may talk a lot and today we do find a lot of blogs on the internet. When there was not such a mean to communicate, God used another way, but not less sufficient. He provided the longest existing texts which are still useful for today and ‘actual’. His Words are not only Wise Words, they are also Words which make others wise. By reading the Bible, we will gain an understanding which is far greater than the wisdom of man’s thinking, because we know that when we read the Bible, we are reading God’s word. In 2 Timothy chapter 3 verse 15, Paul tells Timothy that the Scriptures are powerful, in that they can make us “wise unto salvation”. In other words, the Scriptures can give us the understanding of God’s plan and purpose and explains to us the meaning of God’s mercy in that He will allow individuals like you and I to be a part of that plan. We should, so to speak ‘take in the sacred Scriptures with our mother’s milk’! There’s nothing like the written Word of God for showing us the way to salvation through faith in Christ Jesus. We must come to the Bible with humility and reverence, with love, with a child-like willingness to learn. We must never come to think that we know all we need to know, or all there is to know, or to feel proud that we can remember facts or recite quotations. Such things as these mean nothing unless we use them to improve ourselves, and to help others. 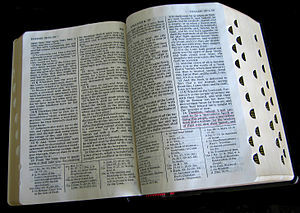 God has given us this God-breathed and useful Book of books not merely to supply information, but to mould and fashion our lives to the glory of His name. The rewards of Bible reading and study do not come in five minutes, or in five days. Even in five years the effects have scarcely begun, the natural, man being so strong and at the same time so resistant to Spirit truth. But if there is lack of serious and prolonged application to this Book, then expectation of true knowledge and any lasting profit is vain. We must be hard-working and thorough in the way we go about our Bible reading. It should not be jumping from one short message on Facebook until the next one. God His blog deserves something better than an easy-going one minute, 15 or 20 minutes of reading a day. We should take the time to let the Words come into our head and make sense, one way or another—showing us truth, exposing our rebellion, correcting our mistakes, training us to live God’s way. Through the Word we are put together and shaped up for the tasks God has for us. For the first four centuries there were a wide variety of answers, most of which came nowhere close to a literal reading of sacred writings. Beyond that, there was widespread disagreement on what writings were considered to be sacred. Even after the question of authoritative writings was settled (what came to be called the “canon of scripture”) the question of what it means continued to a point of controversy, and it still is today. I spend quite a bit of time on social media, especially since I blog and co-host a radio program. So the idea of separating myself from the world wide web was surprising. In fact, several of my friends were quick to assert I wouldn’t last a week. They have no idea how close that came to being true. There were quite a few times I grabbed my smartphone out of sheer habit to see if I had messages or comments, only to realize that I had logged myself out of all my apps. However, the alternate effect was that, for the first time in quite a while, I had a lot more time to do the things I should have been doing all along. I found that by reading and re-reading a text multiple times, I began to see and understand aspects of doctrine unfold and was making the connections I had always assumed based on what I heard others teach. This had a profound effect on me. Paul makes it clear that Timothy had been a student of the word since his youth and instructs him to preach from the word alone to the church. That in the word he would find all that he needed to instruct, commend and correct those who sat under him. we need to know that in the last 10 years 1million Christians have been killed in what is termed a ‘situation of witness’- ie they were there because of their faith, and that today 80% of all acts of religious persecution are directed against Christians… we live in a time when people do not want to hear the Gospel, and when Christians are being persecuted and killed for the sake of the Gospel… (source for these stats: article here on the Spectator website). But Paul encourages Timothy to continue in what he has learned, to be prepared in season and out of season, and to discharge all his responsibilities. There isn’t a clause ‘except if someone tells you not to’. God has given us His Word and we are expected to know it. If we wish to receive Gods approval we are expected to know what the Bible says. We are expected to work and know what God says. We can blame it on so many different interpretations, so many different versions, never going to Bible school, not knowing the original languages, etc. Yet the Bible never one time offers excuses for not knowing what the Scripture says. The Bible simply says we are to study Gods Word and know what it says. We have the world telling us things that run complete opposite to that of the Word of God. We have the world telling us that the Word of God is archaic and no longer applies to us so it must be changed. We have the world telling us that the God of the Scriptures is the same as other gods, and that even though we call them different names, it really is the same god. We believe that the Bible is the only true source of salvation, and only those born again by the Word of God are Biblically saved. It tells the us not to put our trust in those in positions of political or ruling authority, but to put all of our trust in the Lord. Sola Scriptura (Latin for “Scripture alone”) served as the foundation for the four other solas of the Reformation: sola gratia (by grace alone), sola fide (by faith alone), solus Christus (Christ alone), and soli Deo gloria (glory to God alone). These five all fit together as one statement of truth, one declaration of the true saving gosepl of Jesus Christ. Sola scriptura is the foundation upon which everything rests, everything we believe, embrace, and hold dear. The importance of daily Bible reading cannot be over-emphasized in this end of times, when the LORD has said through his apostle: “he that thinketh he standeth take heed lest he fall (1 Corinthians 10:12), and you can only take heed by the word. Thus the Psalmist asserts that for a young man to cleanse his way he has to take heed according to the Word of God (Psalms 119:9). You as a child of God cannot afford to live careless and loose without the discipline and guidance that comes from the Word of God. This entry was posted in Bible or Holy Scriptures, Bible Reading, Bible Study, God (English articles) and tagged Bible, Bible Study, Blog, Correcting, Correction, God, God's Mercy, God's Plan, God's Purpose, God's Way, God's Word, Improve, Internet, Man's Thinking, Profit, Religious text, Salvation, Salvation through faith, Truth, Wisdom, Wisdom books, Work. Bookmark the permalink. ARE CREED BOOKS GOD’S WORD?